The Internet of Everything (IoT) coupled with the growth of software platforms for analytics & automation is accelerating digital transformation. IoT requires connected data and analytics where systems and people can aggregate data virtually from everywhere and analyze anywhere for real-time insights. Connected processes are needed to integrate and automate systems, services (i.e., web, SOA and micro) and processes within the organization and across the ecosystem. People must be engaged in context to enable informed and timely action, connected experiences. IoT is at the heart of the next era of computing and digitial transformation all of which drives new business outcomes in manufacturing, retail, financial services, healthcare, energy and in most if not all industries. Today the business environment is hyper distributed and often unconnected. Small centers of data emerge across the business environment evolving how systems, services and processes are integrated. A new approach is required in this next era: the Internet of Things, computing at the edge, programability of everything, secure process and service orchestration supporting new B2B and B2C interactions across growing ecosystem of partners. This new world of IoT, the next era of computing, requires It requires a programmable infrastructure with policy-based and programmatic access to any asset (physical or digital) and last but not least, it requires application integration across hybrid computing environments. 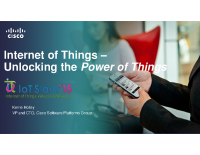 This talk – specially created for IoT Slam Internet of Things Conference, will explore the networked connection of people, processes, data, services and things; the enablers and drivers of IoT and how companies can respond. Kerrie Holley joined Cisco as CTO for Software Platform Group (SPG). As CTO, Kerrie drives the application of Cisco’s analytics and automation software portfolio into vertical markets and cross-industries. Kerrie engages with customers to position our analytics and automation portfolio and architectures to the market. He leads engagements at key conferences and industry/partner forums to create mind-share, awareness, adoption and excitement with external communities. Kerrie was previously an IBM Fellow at IBM Research appointed by the CEO in 2006. His research focused on scalable business services, business purpose platforms, micro services, and related system development and architecture models. He engaged extensively with clients on these topics and the disruptive effects of digitization, API economy, and the “next era” of computing. Prior to joining IBM Research, Kerrie was CTO for IBM’s Global Business Services’ Application Innovation Services (AIS). There, Kerrie was known for his innovative work in service-oriented architecture (SOA) and collaboration with clients as architect and consultant. Kerrie launched IBM’s SOA Center of Excellence where he operated as CTO for several years. Over the course of his IBM career, he was awarded outstanding achievement and corporate awards. Kerrie holds several patents, authored two books, and published articles in peer-reviewed research publications and other venues. 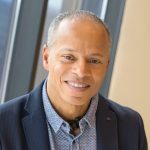 He appeared on ABC News and a TED talk when IBM Watson was introduced describing Watson’s next job. Kerrie holds a Juris Doctorate and a Bachelor of Arts in Mathematics from DePaul University. He is currently a member of DePaul’s Board of Trustees.